July Report: foldable display, smart medical displays, and in-display finger print sensors - Touch Display Research, Inc.
Santa Clara, California, July 16, 2018—In the recently published “Touch and Emerging Display Monthly Report,” Touch Display Research Inc., a market research and consulting firm, analyzed the technology and market trends: foldable display, OLED, quantum dot, ePaper, smart windows, medical displays, and in-display finger print sensors. “Hope you are enjoying a nice and relaxing summer. Both foldable AMOLED displays and foldable ePaper displays are paving the way to foldable display devices in the market in 2019. The smart windows industry is expanding. In-display finger print sensors are taking off with several different technologies. Smart medical devices are adopting more and more displays. 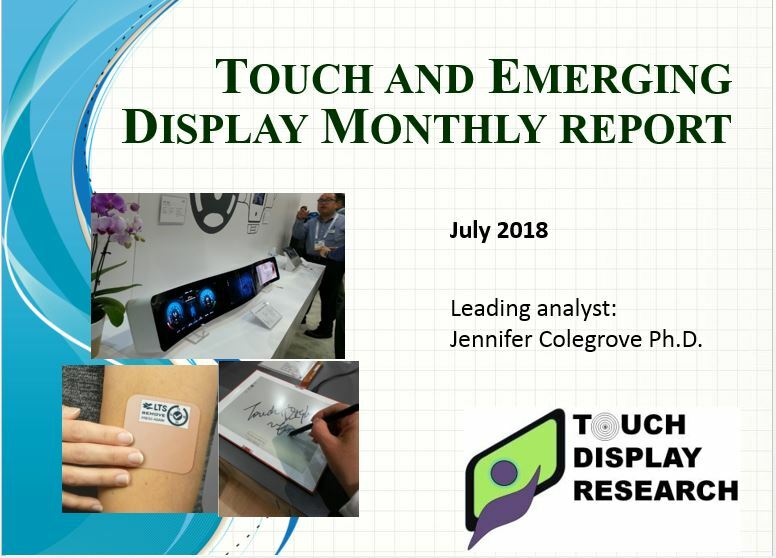 All these new trends are analyzed in this monthly report,” said Dr. Jennifer Colegrove, CEO and Principal Analyst of Touch Display Research Inc., who has authored reports on the touch panel and emerging display industry for over ten years. The July 2018 report is available immediately.